Hey there lovelies, hope you’re having a great Tuesday! Today, I thought I’d do something a little different. Obviously blogging is such a big part of my life and something I love doing so, so much. I’ve spent so much time over the past few years blogging, learning about blogging, researching blogging-related things. I also know that a lot of the gals who read my blog on the reg are other blogger babes. A few weeks ago I shared a post about Big Blogging Don’ts that got some really great feedback. 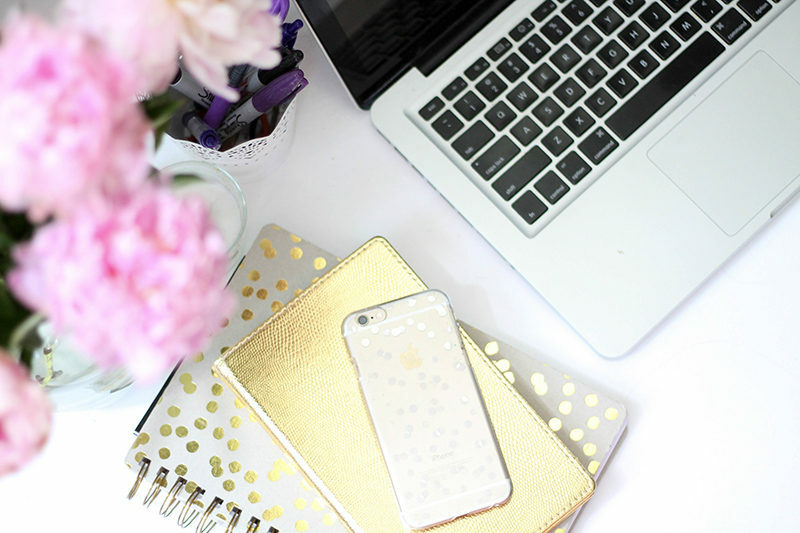 Since it seems like you girls are open to me blogging about blogging from time to time, I thought I’d share a post about my editorial calendar; how it keeps me on track, saves me time, and helps me promote my content. I’ve sort of struggled with this for awhile, trying out different methods and finally I found CoSchedule, which is a fool-proof way to keep track of my editorial cal that I’ve been dying to share. An editorial calendar helps keep you organized and on track. Like I said in my 2017 goals post: “any area of your life that lacks a plan, lacks progress.” If you want to take your blog to the next level, or have it grow at all, you need a plan of attack. An editorial calendar helps you see all of your content and post ideas in black and white. There are tons of different ways you can get yourself organized and plan your content. Some people use Excel spreadsheets, some people use paper calendars, some people use blog planners. I’ve kind of tried them all. What works for me is sort of a combination of things. First, I like to brainstorm all my post ideas in a long list. I just make a list of things I want to write about, outfits I want to share, etc. 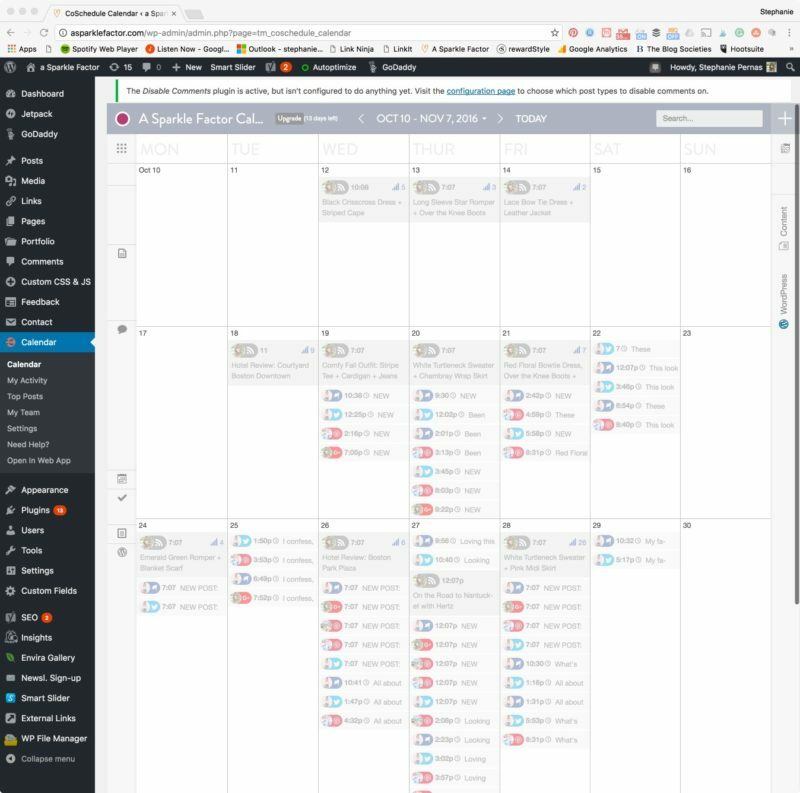 So basically, you install the CoSchedule WordPress plugin and install a Calendar tab on your Dashboard that pulls all of your posts. When you look at the calendar, it shows all of your scheduled posts and drafts. You can drag and drop posts to different dates and times super easily. As you can see below, all of my social posts and blog posts are all in one places. This is my calendar from Oct-Nov, and as you can see… for some reason I wasn’t too great about scheduling over the weekend. Whoops. But that’s a lot of content promotion! And I did it all in one step, it didn’t take any extra time. My favorite part is after you write your post, you can just scroll down to the CoSchedule portion of the post and schedule that post’s promotion on social media right there. Don’t even have to leave the post. When you look at the calendar, you can see all of your posts as well as social media promotions, all in one place. You can also drag and drop the social activations as well to adjust the flow, if you notice one day is too loaded up. #Gamechanger. This is really great for me, because in the past, I’ve used other social media scheduling tools and it’s really, like, 3 extra steps. While it’s doable, I would get super busy and not schedule my social promotions as efficiently. Basically, all of my post promotion gets scheduled in one step and one place and it’s super fast. This is an example of a post and its subsequent social media promotions. This is a post from last week that I just tweaked last night after re-upping my subscription, so it’s not scheduled exactly how I schedule my posts. As you can see, you’re prompted to schedule a post today, tomorrow, in a week and in a month. If this was a new post, I’d have all of those check marked green. (There is also a bonus spot for any custom date you want to set!) You can add as many promos as you like. You can also schedule individual social messages as well, not just post promotion. I love this because it’s a really visual way of seeing how your content is going out. Honestly, this is something I’m JUST NOW figuring out, so I’m excited to get on top of it and schedule some additional non-post related content. 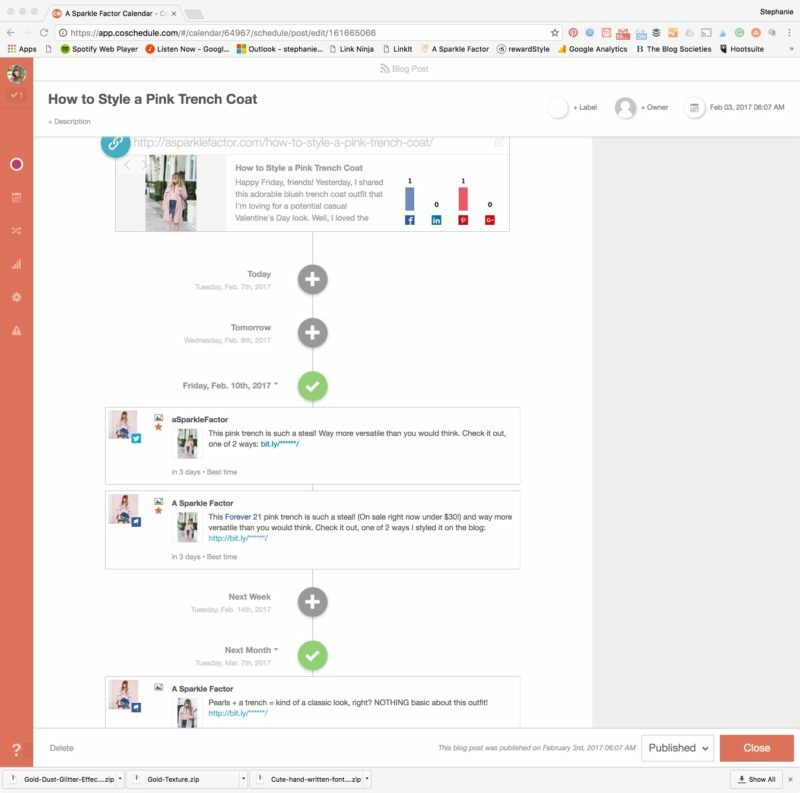 There’s also a newish feature called ReQueue where you can set content to continuously be intelligently re-shared on your social channels. I haven’t used this yet, but am definitely going to investigate. There are also tons of other things that you can do with CoSchedule that TBH, I’m still learning about. Different integrations, like Evernote, Google Docs, and Google Analytics that really streamline the planning and executing of your social and blog content. I always schedule promotion on both Facebook and Twitter: when it goes live, at the best time of the day, the day after it goes live, a week after it goes live, and a month after it goes live. I also schedule it once on Pinterest, Google+, and Linkedin. (For good measure!) I’m still figuring out how much to post, so I’m experimenting with a few different things to see what works best. Anyway, I’m really psyched to have access to my CoSchedule account again. For the first time in a long time, I feel like I’m doing a good job with promoting my posts and like I’m finally on top of my social media. It’s amazing what having the right tools will do for you. Ultimately, if you’re a blogger, you have to treat this like a business. You can’t just… do nothing and expect your blog to grow and thrive. It takes time, effort, and… marketing. I highly, highly recommend CoSchedule. If you want to see what it’s all about, give one of their 14-day trials a test run! (You don’t even have to give them your cc info.) After you’ve tried it out, I’m sure you’ll extend, like I am. I’d love to know– how do you plan your editorial calendar? Do you use CoSchedule? Any tips? Hit the comments and let me know!